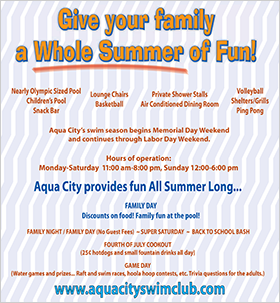 Aqua City’s swim season begins Saturday May 25, 2019 and continues through Labor Day Weekend. Click here to download an Aqua City Membership Application. 0-50 swimmers 2 guards – $110.00 plus tax per hour 50-75 swimmers 3 guards – $130.00 per hour plus tax 75-100 swimmers 4 guards – $145.00 per hour plus tax 100-125 swimmers 5 guards – $160.00 per hour plus tax. Parties can begin at 6 pm, but the pool is open to members until 8 pm. Parties can be scheduled after 8pm. $50.00 plus tax a party with a 2 hour maximum (during regular hours). You can bring up to 15 non-members.